Presenting a continental way to say thank you, the woodies stamp is ideal for enthusiastic crafters who want to add a charming touch to any gift. 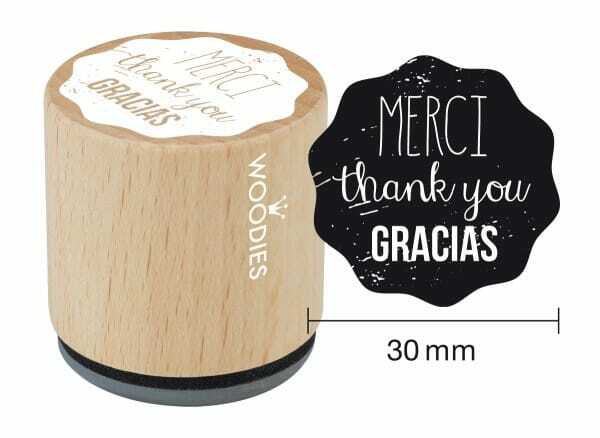 Made from beech wood and 100% natural rubber, the dainty 30mm stamp features shabby chic 'merci thank you gracias' text for a cute finish. A fantastic solution for creative professionals and amateurs alike who want to offer a little more, the woodies stamp is an ideal way to say thank you in style. Customer evaluation for "Woodies stamp MERCI thank you GRACIAS"